All Replies on What finishing process should I use? What finishing process should I use? A mix of beeswax, turpentine or MS, and BLO. Using turpentine can really smell the place up, so MS would make it a little easier to breathe. This will give you a finish that is easily renewed, no film to chip and flake over time, and easy to apply. More info here. The one thing I’ll mention if you choose to use this is that dissolving the beeswax in the solvent may take some time, goes faster with warm temperatures. I just used Watco Danish Oil on my bench. As long as you limit to one or two coats, it won’t develop a film. A good durable finish is Arm r seal. Congrats on you first bench. Most (probably all) finishes you could pick will help with the glue-pop-off problem. Not sure about how they will be with things like electronics, assuming you are seeking some sort of static dissipation ability? Wood in general would be a poor choice for that kind of bench. If you do need some static dissipation, consider getting a small anti-static mat and the associated cords for grounding it and you. When not needed, just roll it up and store somewhere clean. My benches have a quick oil-varnish wash coat on them. Made it from 1:1:1 of boiled linseed oil, mineral spirits and the cheapest polyurethene I could find at the hardware store. Just lives in a gallon paint can. Also makes a great quick dunk and drip-dry finishing method for small boxes, etc. More or less the same as Watco as far as looks. A bit cheaper. One hasn’t been renewed in about 10 years and is still fine. The other gets flattened with the jointer plane occasionally and so I just renew the finish then. Usual warnings about oily rags apply. One hasn t been renewed in about 10 years and is still fine. The other gets flattened with the jointer plane occasionally and so I just renew the finish then. I should mention that I am a complete novice woodworker. I built bookcases and such in high school shop class but that was almost 20 yrs ago now. I guess what I should ask is what is a neasy finish to apply. As far as anti-static properties, that is not a concern. I have a mat already I just finally have a garage that is all mine and no longer have to have random projects strewn around the house lol. Like I said main purpose is small projects. I my throw an3d printer on it at some point. But other then that work on my drones and such. I highly suggest boiled Linseed oil, and then a coat or two of paste wax. Glue will stick to most finishes, however a coat or two of paste wax makes the dried glue just pop off with no issues. Speaking from the school of hard knocks. rick nailed it in one word. I built a workbench top from spalted ash. It was so pretty that I didn’t want to use an oil based finish. I went with a water based Poly. That was 6 or 8 years ago, and it’s still holding up great. Much tougher than I thought. Minwax poly thinned 1:1 with ms. Put in on like waterlox or the danish oil stuff. Get it on the surface, dont be stingy. Keep the surface wet for 10 min or so. Wipe most of it off. Repeat. 2 coats are enough unless you want to make it pretty. Laminate is a good choice for the top, or masonite/hardboard with a coat or 2 of thinned poly – those tops can be replaced anytime. Furniture wax will let the glue pop off easier. Finished and in place. I did 3 coats of BLO to start… followed that with 2 coats of a 1:1:1 blo,ms, and a satin poly. Turned out great I though. Definitely accomplished the finish I was going for. Thanks for the advice. 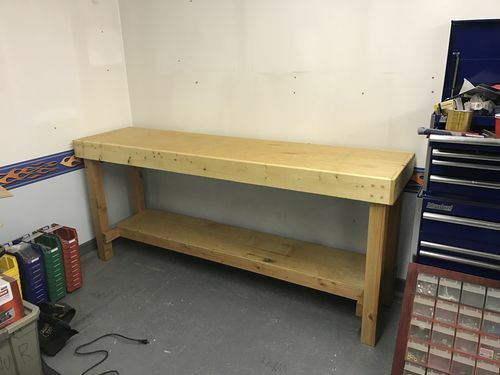 I built a workbench/router table and used Watco Danish oil as someone else mentioned. Just a couple coats. What sold me was every year I can sand quickly and throw on a fresh coat w/o hassle. It’s in wood so doesn’t chip off like a desk I have with thick poly. Don’t know how poly is for this: an unexpected benefit was that glue doesn’t really stick to it and can run a chisel over it and peel off.